The road into Hermiston is lined with flat fields browned by the cold of winter. “This is where two people won within the same month,” said José Garcia, an addictions counselor who has his own practice, New Horizons, in Hermiston. He is taking us on a tour of all the places his clients play video lottery games. He tells stories of wins, losses and the people who show up at his door. “Remember I told you about that?” He’s pointing at a brightly lit convenience store on the corner, though it’s just one of many dozens of places where gambling is legal in Hermiston. As legalized gambling grows, so does the impact on communities vulnerable to gambling addiction, advocates say. And in Oregon, counselors such as Garcia say the lure of the lottery is hitting Latino agricultural workers and low-income families especially hard. Counselors hear the gamblers’ dreams: Taking care of family back home, opening a business and buying a big house — the American dream. Immigrants with families established in the U.S. also mention that gambling winnings can help pay for the processes of gaining U.S. citizenship. While gambling affects all racial and ethnic groups, experts say video lottery games — a feature of the Oregon Lottery — may be especially appealing to recent immigrants because the games are easy to navigate whether a gambler speaks English or not. Garcia has lived in Oregon the majority of his life. He moved to Hermiston from neighboring Yakima in 1989, when he had a young family. That DUI led him into recovery. About a year in, he started volunteering with Umatilla County to help others, because he saw the gap in treatment available. Today, he runs New Horizons with his wife, Letty Garcia. “I saw that there was people coming in, they were monolingual, and there was nobody there that was helping them out,” said José Garcia, who is Mexican-American and can speak Spanish. As we drive around, Letty Garcia helps navigate from the back seat. She tells Garcia to visit restaurants with new additions that provide a designated space for the 21-and-older video games to be installed. He drives into the lot of a small Chinese restaurant and pulls around back, just as a man enters a door to the backroom poker machines. Letty worked in childcare before joining her husband in his counseling work. Before his recovery and career shift, José Garcia was like many of his clients, working long hours in the rich soil of Eastern Oregon. “I never, not ever, in my dreams did I think I would end up being a counselor, you know?” he said. But Garcia got tired of seeing his clients — particularly ones with DUIs on their records — failing to fulfill their court-ordered requirements because they did not work traditional 9-to-5 jobs or couldn’t take time off to attend classes. Having lived that reality himself, he decided to branch off and offer services that would meet the needs of his community. Today, New Horizons treats more than 100 clients for substance-abuse addictions, problem gambling and court-ordered DUI classes. Paperwork has replaced scheduling as the biggest challenge. Some of his clients are undocumented immigrants. “I do have a lot of people that they have no documentation, and they're so afraid to even fill out paperwork,” Garcia said. The center receives funding from the state for its services, which means clients have to fill out large packets with personal information. Garcia said the documents make his clients uneasy, especially under the Trump administration. Gambling has always hit communities of color, and as access to legalized gambling is getting easier, the risks of gambling addiction expand. The lack of resources — and specifically the lack of culturally specific resources — is becoming more obvious. In Portland, counselors at the Latino Problem Gambling Services Clinic say there are myriad reasons why their clients had a gambling hobby turn into an addiction. For people who are undocumented and paid under the table, the easy access to cash makes them more susceptible to gambling — and their status can make it harder to stop, said Karla Parra, a counselor at the clinic. One example: People with bank accounts can limit how much they withdraw in a day — one way to curb binge gambling. But to get a bank account, you need a government-issued ID. So that leaves out undocumented immigrants. The Latino Problem Gambling Services Clinic is part of Lewis & Clark College’s Graduate School of Education & Counseling. The college actually runs two clinics — one upstairs for Latino clients, and one downstairs that caters to a mostly white clientele. The conversations are vastly different from floor to floor. Counselors say another big challenge in helping Latino clients is erasing the stigmas around gambling addictions and mental-health treatment. Problem gambling is an addiction that people are not as familiar with as, say, alcoholism. DeLeon was charged with leading the center when it was created in fall of 2017. Her two counselors travel the Portland region, an area of more than 1 million people. One of their meeting spaces is housed within a Latino community organization, and the counselors said their clients feel more comfortable talking there rather than in the sterile office building the university provides. Meeting on campus feels like they are going to counseling — something not always embraced in the Latino community and some other communities of color, where people of faith place their trust in God rather than institutions. The mistrust in doctors goes back generations, to a long history of trauma surrounding medical studies and testing. For some of the clinic’s patients, the sheer act of going to therapy is seen as betraying your faith, and even your family. “‘No estamos locos. We're not crazy. Why do we need to go to therapy if we're not crazy?’” she said. And the counselors at Lewis & Clark face one more challenge: In many Latino cultures, gambling is an accepted part of everyday life. DeLeon and Parra spoke about La Lotería, a game played in many Mexican households that is similar to bingo but with pictures on the cards instead of numbers. It’s played from an early age, with winnings of small dollar amounts, toys or candies. Adults can play for major money. Poker, craps, dominoes and card games are played at family gatherings. Experts say gambling addiction often occurs alongside substance abuse or other mental-health problems. But unlike other addictions, problem-gambling can be hard to spot, because there might not be physical evidence that someone is in trouble. No drastic loss or gaining of weight, for example. DeLeon said that hasn’t stopped family members in some cases from noticing problems, or feeling betrayed once they do. Lewis & Clark provides free counseling for gamblers and their family members, creating one less barrier to treatment. Family members are taught how to confront their loved ones or get treatment as a family. DeLeon said family counseling is important because of the collectivist culture of Latinos who come to the clinic. Saturday-night entertainment in Hermiston has its limitations. Teens crowd the hallway of the town’s bowling alley; folks flock to a locally owned Mexican restaurant where two women make fresh tortillas at the front. Just down the road, moviegoers stream out of the theater after the weekend’s latest box-office hit. The next closest theater is 20 miles away at the Wildhorse Resort & Casino on tribal lands in Pendleton. The Confederated Tribes of the Umatilla Indian Reservation are one of eight tribes that own and operate casinos in Oregon. The Wildhorse looks like what you’d expect: It’s dimly lit and smells of cigarette smoke, and the game room buzzes with neon lights and high-pitched rings and dings. Familiar faces and voices from “the Simpsons” barrell out of one popular video terminal. Outside the gaming room, the casino has become a destination for family fun, with casual dining options, the movie theater, teen arcade and a childcare center. On the game floor, Latino servers cater to a Spanish-speaking clientele, providing a feeling of belonging to a community that can often feel isolated. “Why do you think that the Latinos are so hooked up in the casino? Because they treat them good. They make them feel good,” José Garcia, the Hermiston addiction counselor, said. He began worrying about the casino targeting Latino Oregonians when they hosted Mexican entertainer Ramon Ayala. He’s performed there the last two years. Liberty-Traughber said they’re just booking acts potential customers want to see. Casinos are becoming community gathering places across the rural West. In Oregon, each federally recognized tribe is allowed one casino in the state, part of U.S. efforts to make amends with tribes for generations of attempted genocide of Native Americans by European settlers. People who would never have dreamed of setting foot in a gambling hall now happily go to concerts, dinner and the like at casinos. Liberty-Traughber points to the financial support Wildhorse provides for her tribe. Registered members of the Umatilla tribe receive a quarterly check from the casino’s earnings. The value differs based on the casino’s profits. And those profits are growing. In April, the casino will break ground on its latest expansion to create a new tower of hotel rooms and a bowling alley. The casino property already includes a truck stop, a golf course, an RV park and teepees where the Boy Scouts camp in the summer months. Across the road, you can see the impact the casino is having on the tribe. There is a governance center, a school that is under construction, and the Yellowhawk Tribal Health Center, completed in 2018. 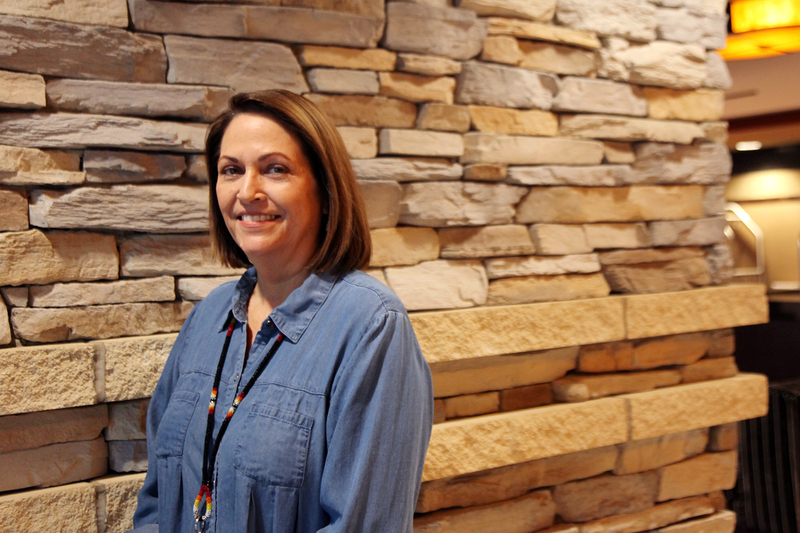 Liberty-Traughber said she is aware that everyone does not gamble in a healthy way and said the health center provides a range of services, including problem-gambling counseling for members of the tribe. While that is helpful for her community, Garcia continues to worry about the impact of the casino on his friends and neighbors. Back on the tour of Hermiston, Garcia pulled his pickup truck into a shopping center parking lot. “This is where some of my clients tell me they park,” he said, passing by a Safeway supermarket. At the other end of the lot is a Shari’s restaurant. This diner-style restaurant is yet another place to gamble. If you don’t want to buy scratch-off tickets at a gas station, you can play video poker while waiting for a slice of pie at Shari’s. Come the end of the year, Oregonians will have another option to gamble: in their pockets. In May, the U.S. Supreme Court ruled the ban on commercial sports betting across the country was unconstitutional. Overturning the ban is said to have unleashed a multi-billion-dollar industry that was once relegated to the black market. The Oregon Lottery is positioned to reintroduce a new tech-savvy version of a sports betting game they actually introduced in the late 1990s. Sports Action was a parlay game in which players bet on NFL teams at local lottery retailers, similar to Keno. The game was shelved after NCAA officials said they were unwilling to host games in states where sports betting existed. The lottery found that the state could make more revenue hosting March Madness games and the like than on Sports Action. Now, the Oregon Lottery is developing an app they hope to roll out in time for the 2019 NFL season. The app will have unique player profiles, allowing for problem-gambling safeguards such as tracking a player’s wagers, how often they bet and maximum wagers for a game or even a 24-hour period. Oregon Lottery donates one percent of its annual earnings to problem-gambling treatment and awareness. That’s $1.41 per resident. In the latest campaign, they worked with problem gamblers in recovery to create the language for the campaign. But, Garcia said, new ads, even ones in both English and Spanish, will not be enough to reach his community. As he rolls around town on a Saturday night, watching people duck into back rooms of restaurants reminiscent of speakeasies, he talks about his desire to shift his counseling to strictly problem gamblers and leave the rest of the practice to his staff. Until then, he will keep tucking green-and-yellow Spanish-language problem-gambling awareness booklets that say, “¿Quiere Apostar?,” or, “Wanna bet?” on the cover around Hermiston. Erica Morrison joined the OPB reporting team and Sharing America in December 2017. Prior to joining the team, she was a producer for NPR & WBUR’s Here & Now and freelanced at a number of now-defunct NPR news magazines at the network’s headquarters. Erica began her journalism career as a print journalist but transitioned to public radio after the reality of the collapsing industry got to be too much. She is a proud graduate of “The Mecca,” Howard University, and a native of the DMV.